Burnley kept a third successive clean sheet last Saturday when, having beaten both Watford and Stoke 1-0 in the previous two games, we earned a 0-0 draw at the Amex Stadium against Brighton. 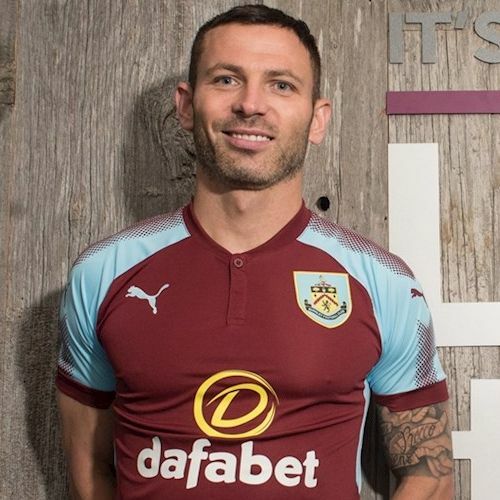 The man of the match vote and the player ratings have come to an end and it was no surprise to see two of our defenders come out with the most points as right-back Phil Bardsley (pictured) won the vote whilst the returning Ben Mee took first place in the player ratings. It was very, very close for the man of the match but Bardsley won it with 19% of the vote, just ahead of the 18% won by Jόhann Berg Guðmundsson. Mee was next with a 16% share while Jack Cork took fourth place with 13% of the vote. Three of those four were in the top four of the player ratings although they were not in the same positions. Mee was the winner this time with a rating of 7.62 out of 10 and goalkeeper Nick Pope took second place with 7.24. Cork was third with a rating of 7.19 and that just beat Bardsley who finished in fourth place with a rating of 7.14 out of 10. The result means Mee has won the most points towards the Up the Clarets Player of the Year. He won seven points with Bardsley collecting six. All of Cork, Guðmundsson and Pope won three points each. It’s really close between the top three and they are the three players who have started every league game. James Tarkowski still leads the way with 71 points, followed by Steven Defour who has 64 and Cork with one less at 63. Guðmundsson and Pope are in the next two positions but are currently 20 and 22 points behind third. The next man of the match vote and ratings will be underway on Saturday evening after the Spurs game and the Brighton result is below along with the current player of the year table.